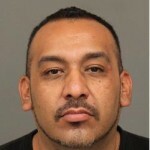 Paso Robles police arrested a 34-year-old man who allegedly stalked his ex-wife and attempted to run her off the road on Tuesday evening. After allegedly stalking her throughout the day and harassing her with text messages, Ernesto Flores Duarte began chasing his ex and her friend in his car. He then attempted to run them off the road, police said. After several attempts to block the path his ex was attempting to take, the cars collided shortly after 11 p.m.
Police arrested Duarte and booked him into San Luis Obispo County Jail on two counts of assault with a deadly weapon, a count of stalking and driving on a suspended license.